The newly elected president of the Democratic Republic of the Congo has hired Avenue Strategies Global, which has close ties with the Trump White House, to make the rounds of DC. 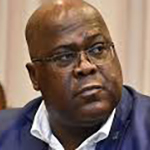 The office of Felix Tshisekedi, an opposition figure whom the New York Times reported Jan. 24 won a tarnished election, hired ASG for representation before the US executive branch and Congress. The DC-based firm also will "implement a media and PR plan to improve understanding of the president-elect and his agenda for the people of the DRC," according to its memorandum of understanding. ASG will receive a $90K fee for its services from Jan. 22 through Feb. 28. There's an option for each party to discuss extending the relationship at any time. Corey Lewandowski, Trump's former campaign manager, and Barry Bennett, senior advisor to the Trump campaign and Ben Carson's campaign manager before that, launched ASG.